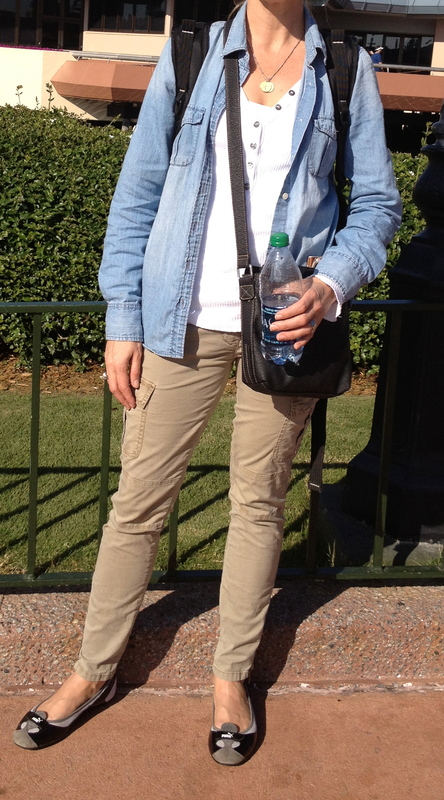 We did Epcot yesterday, and I am exhausted! I loved every minute of it though… friends had told me that it wasn’t that great- and to even skip it- but boy am I glad we didn’t! We had so much fun, saw so many things, and did some amazing rides! Again, I dressed in layers- and am glad I did! I kept changing my outfit throughout the day- it would be warm, then cold and windy, then warm again… crazy! I wore my skinny cargo pants, a tank top, a white waffle style cotton shirt over the tank and then my denim shirt on top. As you can see, I have a small black cross body bag to hold my essentials (lip stick, sunglasses, map and tickets) and then on my back I have my backpack with the bigger stuff. I’m wearing my Puma’s- which proved again to be a great choice! My feet never hurt! As I stated on the first day- I know this isn’t the most fashionable look in the world- but it is cute enough to not embarrass my family! Not to be mean- but I did see some things I would advise not to wear. It’s a horrible picture, but can you see this gal’s stretch pants? I wonder if she looked in the mirror before she left the hotel room? This is awful! It’s hard to see, but this gal has little Winnie the Pooh on the back of her socks… seriously?! Today we are hitting Universal Studios! I’ll post my outfit from today tomorrow! Epcot is my favorite! And – most importantly after a long day at the park- it serves alcohol! Best ride ever is Soaring over California at Epcot. I think your outfit is adorable! Have fun! Your blog this week should be required reading for all Mom’s headed to Disney or any other theme park. 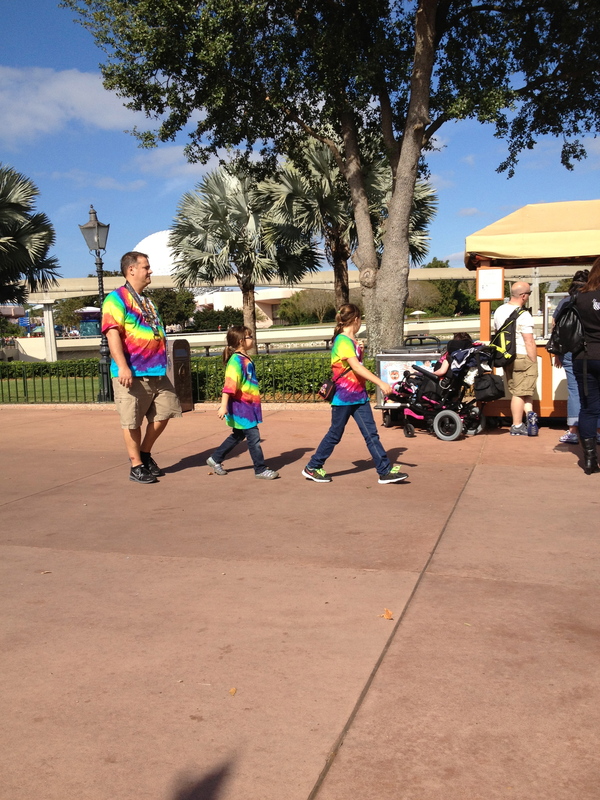 I like the tie-dye shirts! If there is one place in the world where something like that is okay it’s Disney. Seriously, get your FastPass for “Toy Story Mania”! I challenge you to beat my score of 73,000. If you can get in try to eat at “Sci-Fi Dine in Theater”, it is one of our favorite spots in Disney (full bar service for Dad and Mom). I love your “on location” style advice. It’s hilarious! And, you look adorable, Megan! Enjoy the rest of your trip and have a great Thanksgiving! I can’t believe those cute shoes are comfortable–sweet! Great theme park outfit. We did Sea World repeatedly this summer and I wasn’t nearly as put together. We’re a ‘summer’ disney family so it’s never about the fashion and instead it’s all about the moisture wicking shorts/tees/ socks and real sneakers. Sadly, not very fashionable but it is what it is. Anyway, enjoy your time there. Glad the puma’s are STILL giving you mileage. It’s gotten too cold up here in the northeast to go sockless so mine are retired until the spring. You know, you are right! Wearing matching shirts is a great way to spot a family member in case someone wanders off- I could have used something to help me find my 11 year old who wandered off today! My only issue is that it is a little ‘dorky’ but I guess that’s just my pettiness and me being judgmental (a quality I am working on getting rid of). That being said- I did see a few families who dressed in the same color- not matching shirts- but all in yellow, or orange… this was a great idea, especially when you have a huge group this helps everyone stick together. Hmmm… I really enjoyed this blog until this post. 😦 It’s Disneyworld. Who cares what they are wearing if they are enjoying time with their family. I like seeing the everyday style, but this is a bit harsh. If you are going to wear character socks and tie dye shirts, that is place to do it. It’s all about fun. I worried I would hurt someone’s feelings when posting about the character socks- and I apologize! Personally, I wouldn’t chose them- but you’re right- if it makes you happy this is the place to do it! Mostly this post is about suggestions on what to wear- not to be super stylish, but just suggestions on what might work at Disneyworld. As I stated- I get several emails with this exact question. When I was a kid my friend’s mom dressed her three kids all the same when they would go anywhere with crowds. I thought it was weird, but she said if she ever lost one she could easily remember what the child was wearing, and even provide an example to the police. My daughter and I will wear matching sweaters tomorrow for Thanksgiving – silly but fun, And she will not want to dress like me forever so I will relish it! When my daughter was little we used to dress alike sometimes too- we even had outfits for her American Girl doll that matched- it was adorable!! Hi Megan! I love your blog 🙂 I don’t care where you are, Disney world, tie dyed shirts and Winnie the Pooh socks are NOT fashionable and after all this is a fashion blog. To each their own, but I don’t think you need to apologize for your personal opinion.